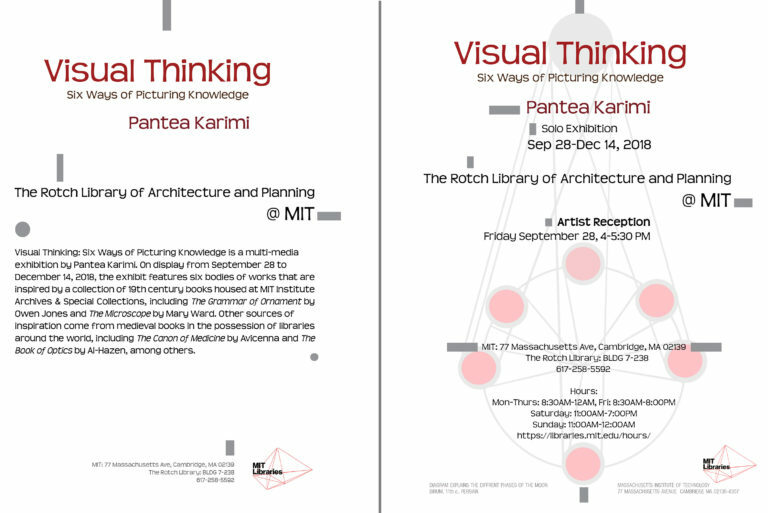 Visual Thinking: Six Ways of Picturing Knowledge is a multi-media, site-specific exhibition by Pantea Karimi at MIT’s Rotch Library of Architecture and Planning. 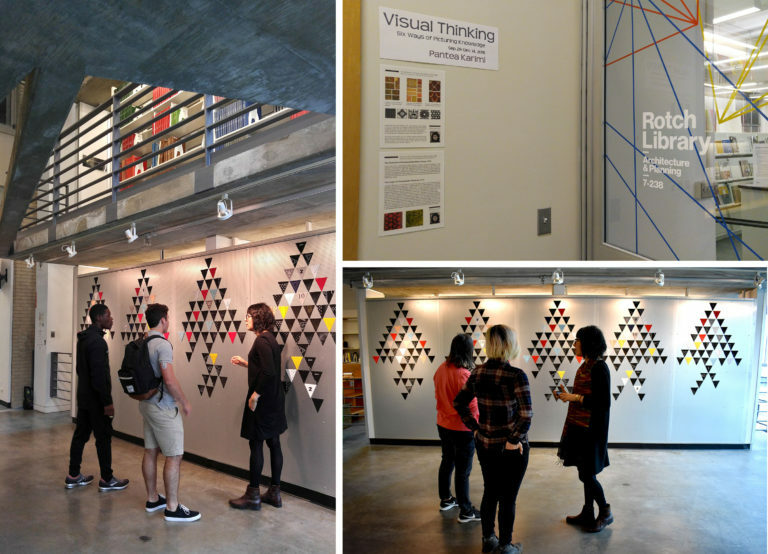 On display from September 28 to December 14, 2018, the exhibit features six bodies of works that are inspired by a collection of 19th century books housed at MIT’s Rotch Library and the Institute Archives & Special Collections, including The Grammar of Ornament by Owen Jones and The Microscope by Mary Ward. 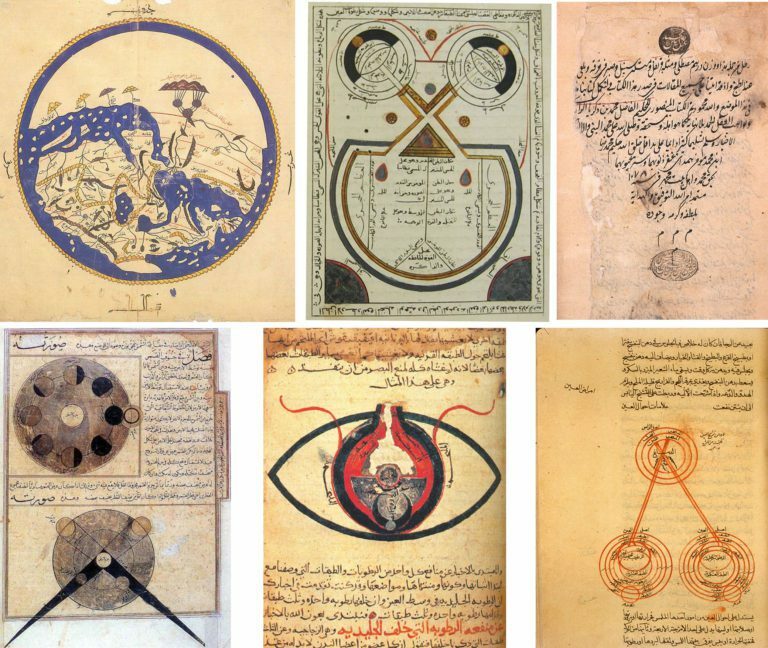 Other sources of inspiration come from medieval books in the possession of libraries around the world, including Sidereus Nuncius by Galileo Galilei, The Canon of Medicine by Avicenna and The Book of Optics by Al-Hazen, among others. 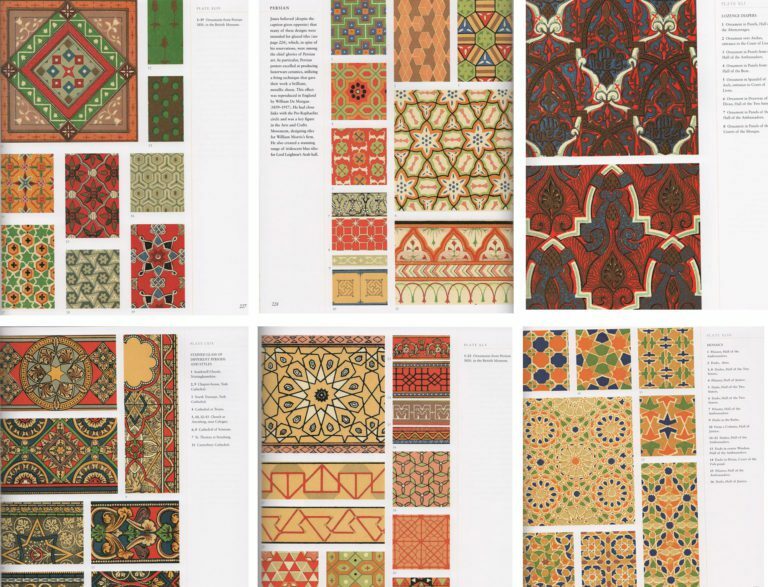 I used the 1865 copy of The Grammar of Ornament by Owen Jones to create a series of colorful geometric small-size tiles. I selected patterns from different regions of the Islamic world and medieval Europe featured in Jones’s book. For me, this transition of the ornament from 2D surfaces to 3D tiles highlights Jones’s work in architectural manner. 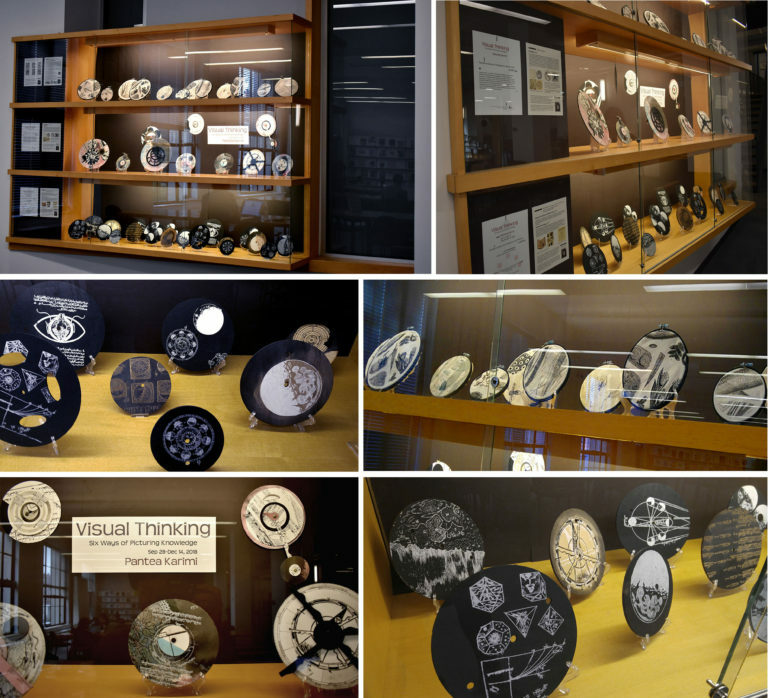 Owen Jones was a passionate designer, printer and craftsman. Like Jones, I have passion for design and printing medium. Furthermore, I found his manuscript and the way he archived his findings quite systematic with a scientific sensibility. Growing up in Iran, I was always fascinated with floral patterns that I saw on Persian carpets and tiles in mosques and historical monuments. Although, most of the floral patterns drew inspiration from nature, I first recognized geometry and the grids in their design. The memory of Persian stained glass windows and colorful lights inside the architectural spaces provided other sources of inspiration for this project. 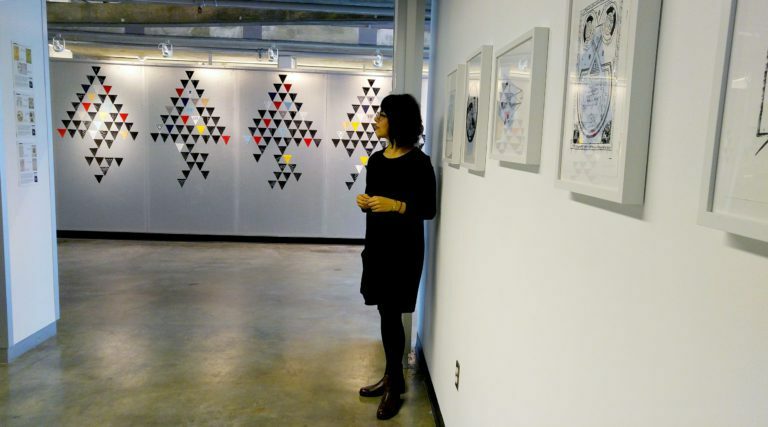 In my display of Jones’s works, I utilize square color-plexiglass pieces to remind the viewer of tiles in architectural spaces and the transparent plexiglass lets the light through like stained-glass windows. I amplify the patterns and use silkscreen to print them on each tile to highlight the beauty of their design. The tiles may be displayed in various formats while maintaining the integrity of decorative and architectural aspects of Jones’s ornaments. Mary Ward was a 19th century Anglo-Irish naturalist, avid amateur astronomer, microscopist, author and artist. At the time in Ireland, universities and most scientific societies would not accept women but she was determined and persistent in pursuit of knowledge. She lacked formal training in science but corresponded with universities and scientists to obtain information. 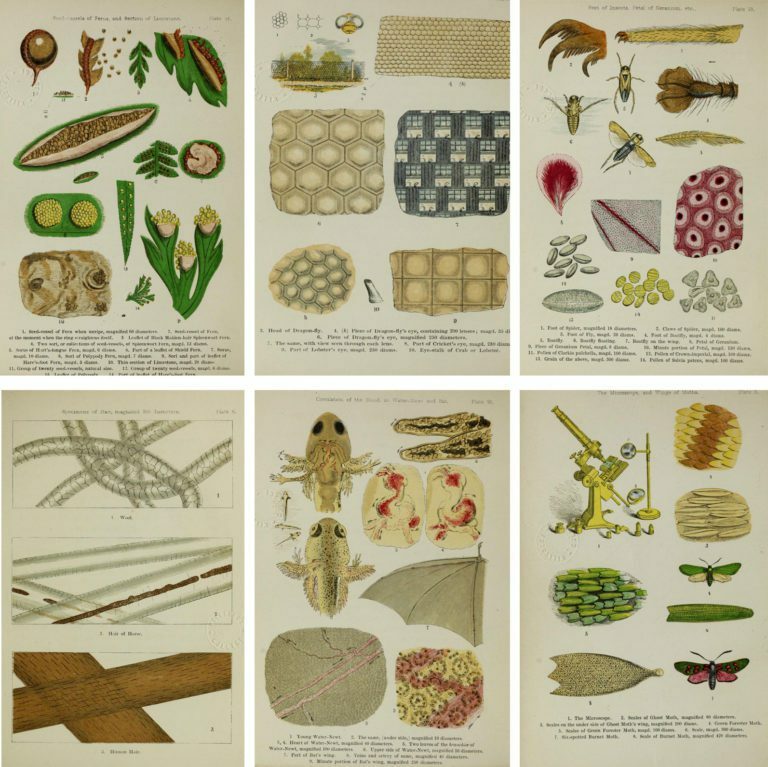 She wrote popular works including The Microscope, published in 1869, which its third edition is owned by the MIT. 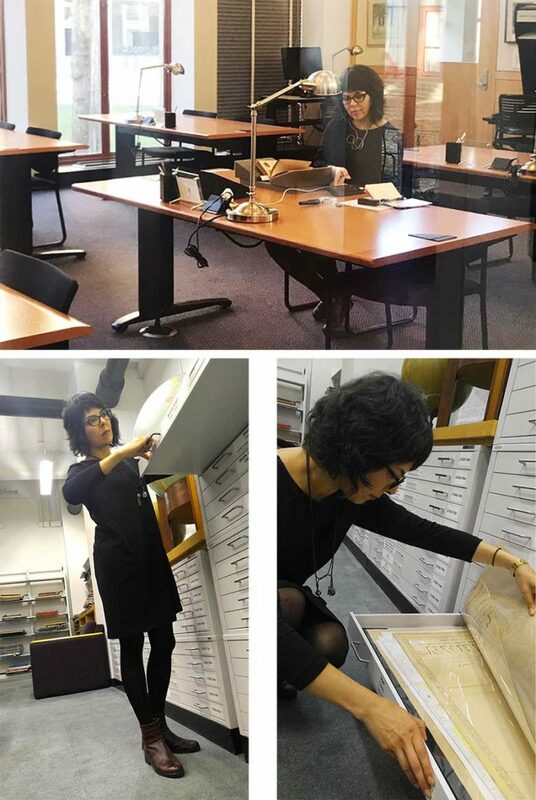 This manuscript placed her among the earliest women to publish in such fields. All of the illustrated plates in her manuscripts were produced from Ward’s own drawings, showcasing her artistic skill and ability. 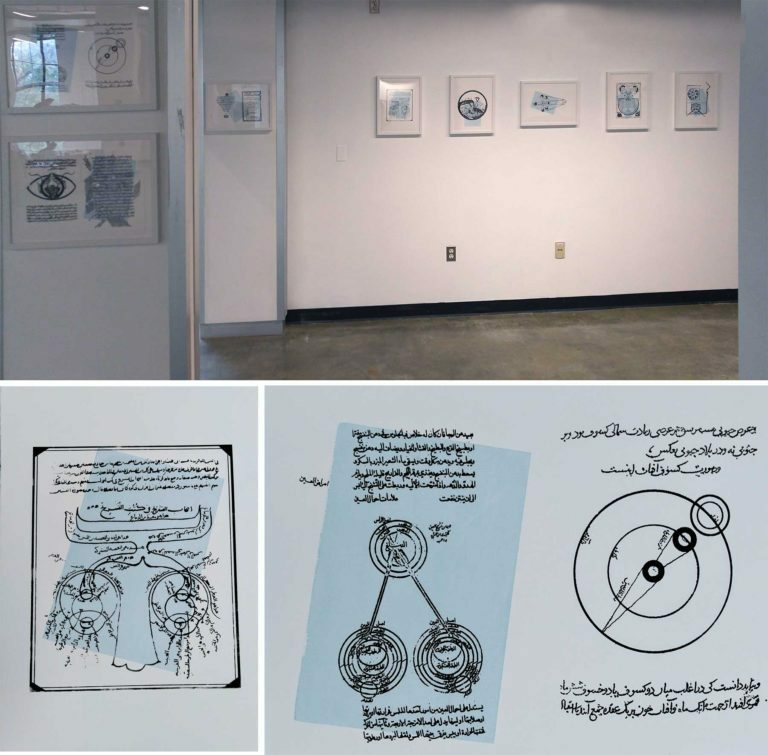 The Microscope manuscript includes notes and intricate drawings of insects, seeds, plants, animals’ hair, and birds’ feathers that Ward observed through microscope. Owen Jones was an English-born Welsh architect, craftsman, printer and designer. Jone’s theories on flat decorative patterning still apply today. Jones published his sourcebook, The Grammar of Ornament, in 1856. 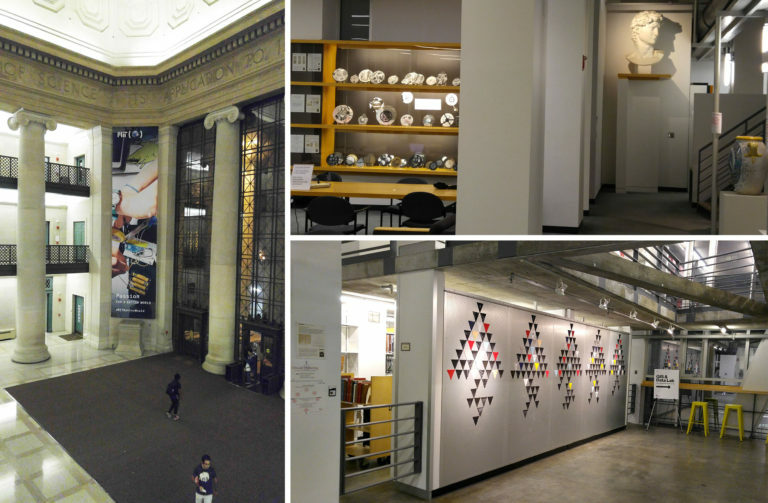 This manuscript is shelved in the Rotch Library of Architecture and Planning at MIT. The first few chapters of the The Grammar of Ornament present key examples of architectural patterns from diverse sources, both historically and geographically, examining the Middle East in the chapters on Turkish, Arab, Moresque (Alhambra) and Persian ornaments. The book also examines the patterns from medieval Europe as well as leaves and flowers from nature. Medieval Islamic Manuscripts Folios, 10th-14th C.